Green Trends Unisex Hair & Style Salon one of the fastest growing salon chains in the country belongs to FMCG major CavinKare Pvt. Ltd.’s salon division Trends In Vogue. The salon is the pioneer in the Indian beauty Unisex salon segment which has played a key role in transforming unorganised beauty salon industry into an organised one. The brand is well known for its expertise in providing unique grooming services, fashion styling and bridal make-up. 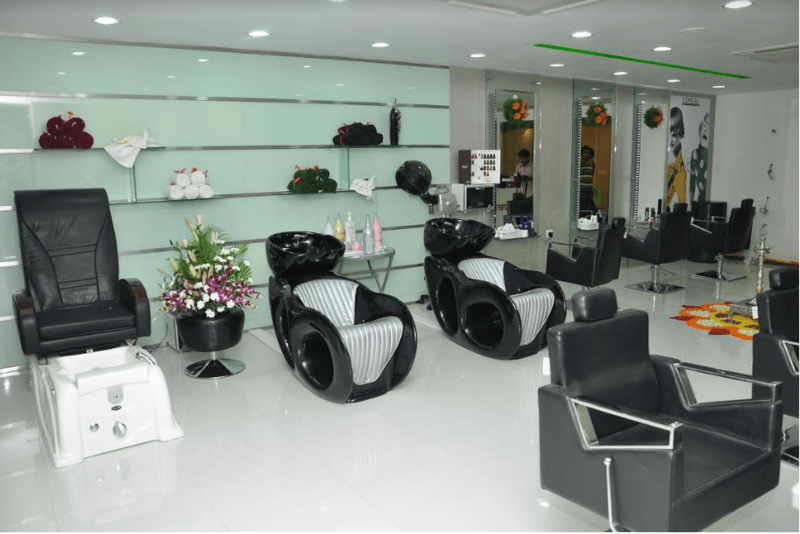 The unique salon chain has a strong presence in Bengaluru through its 20 plus outlets which provide world-class infrastructure, innovative and trendy services with utmost care and perfection. I decided to check out the salon at BTM Layout. The salon is done by in a contemporary manner and the furniture is in black – simple straight lines with a pop of colour coming from the green and pink branding of the name. Green Trends has recently introduced a skin analyser that uses a camera that magnifies the skin and hair and shows the current condition of the same. After the test, I was told that my skin and hair was dry and hence I was recommended the Perfect White Ultime Facial and a Casmara Mask. My therapist Indu started with a dual cleansing ritual that helps remove makeup (if you are wearing it) and then deep cleans as well. Post this she applied a concentrated serum and an enzyme mask to that helps reduce wrinkles, tightens skin and lightens complexion. A gentle face scrub with kiwi and a steam is followed with a peel off whitening mask. After this I am given a vitamin vegetable mask called Casmara Prestige that ensures a nice even tone and hydrates my skin completely This facial nourished your skin for an innate radiant skin and I felt fresh and my skin was glowing post the session. In fact I also had a quick chocolate wax on my arms while the mask was drying that also saved so much time! After my facial I decided to go for the Alchemy Spa Treatment SP Wella. After washing my hair, my therapist Punith, applied the mask, in my case a volume one and massaged it thoroughly into my hair. This was left on for close to 20 minutes before it was washed. I was told that I would not be given a steam as my scalp was sensitive. An infusion is then applied on based on the same treatment – volume to strengthen the roots of the hair. Deeply relaxing, the head, neck and shoulder massage is an ultimate in hair care. At the end of the session, I could feel that my hair was soft and the complete opposite of what it felt when I came in. While the hair spa was on I experienced the Crystal Spa Pedicure as well that has a lovely gel soak followed with a cuticle cleaning process, scrub, masque and massage that left my feet looking like a million dollars. The session again helps you to relax and I was glad I opted for the same. In all a visit to Green Trends Salon had me getting a great session of looking after everything from head to toe and I can tell you it is a great feeling to come out after many hours feeling refreshed, relaxed and rejuvenated. Well the ‘me’ time is great and you look and feel good – that is the best deal. So what are you waiting for? Head to the nearest Green Trends Salon for some indulgence! Area/Size: G +1, 1743 ft.
Timings: 08.00 a.m. to 21.00 p.m.